I am often asked to restore files on fileservers and also look for user who deleted files. By default there is no auditing for files enabled on fileservers. I will write how I do enable it and how it works for me. 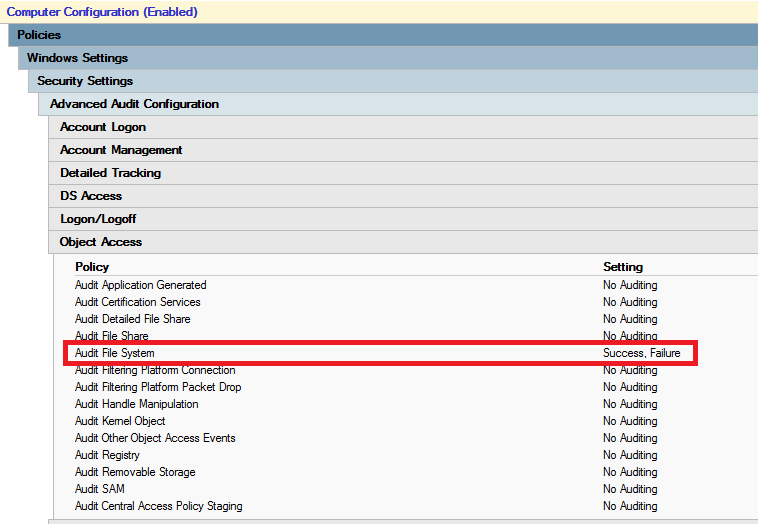 First of all you need to enable audit policy Audit object access. This audit policy handles auditing for files, registry keys, shares, … To enable this audit policy you need to set it in GPO Computer Configuration – Policies – Windows Settings – Security Settings – Local Policies – Audit Policy – Audit object access and set it to Success, Failure. This audit policy enables auditing for lots of objects to audit. I want to audit only File System. 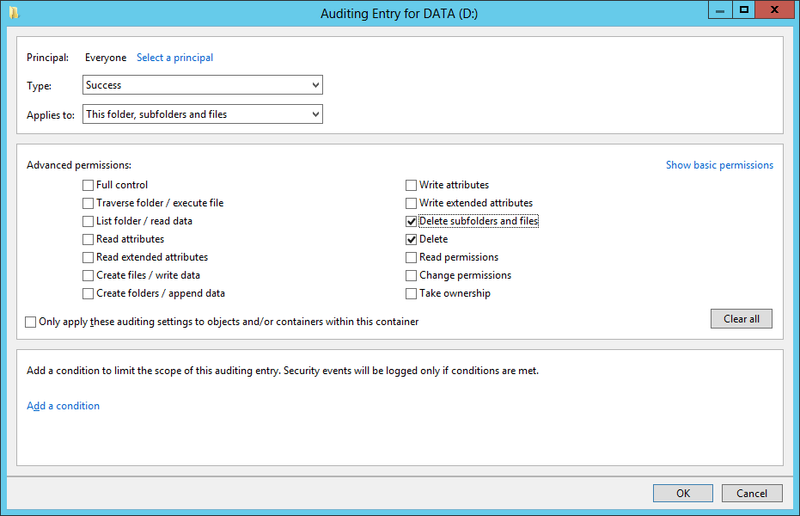 To find out what audit policy settings are applied on computer use following commnad auditpol.exe /get /category:*. To enable only wanted auditing I have dumped settings using auditpol.exe command and set same auditing in GPO, but under Object Access I just enabled File System auditing. You can set this settings under Computer Configuration – Policies – Windows Settings – Security Settings – Advanced Audit Configuration. $EventList | Select DateFileDeleted, UserName, DeletedFile | ConvertTo-Html | Out-File "$($path)\$($Today.Year)$($today.Month)$($Yesterday.Day)_DeletedFiles.html"
$EventList | Select DateFileDeleted, UserName, DeletedFile | ConvertTo-Csv | Out-File "$($path)\$($Today.Year)$($today.Month)$($Yesterday.Day)_DeletedFiles.csv"
Write-Host "No events $EventID to record." This script also cleans up files older than 180 days. In HTML file you can see when, who and what deleted. I didn’t excluded files started with “~”, which are also known as temporary Office files, which are created during opening Office documents. This is because now I know who opened which files and when. 4659 nieje jedine ID ktore moze indikovat zmazanie suboru.